I’ve been using the AMG Viela turntable and 12J2 tonearm as my personal reference for better than four years. AMG recently announced a new version of 12J2, called the 12JT (for Turbo). As a standalone arm, the 12J2 sells for $4,500 whereas the new arm comes in at $8,500. I was excited to see and hear what AMG had achieved with the new arm. Anyone familiar with the original AMG 12J2 tonearm will immediately see the family resemblance of these two tonearms. You will also immediately see that the 12JT is more impressive looking. It features a slightly larger bearing housing, an even more beautifully-machined counterbalance and equally impressive-looking silver locking thumbscrews. It’s still not a tonearm with much bling, but it simply looks of precision and impressive build quality. In use, the most obvious difference between the two arms is in how you set them up. The original 12J2 tonearm came with a really nice set of precision tools that you used for all the adjustments of the tonearm. The Turbo does away with those tools and instead has nice thumbscrews you use to set everything: VTA, VTF, azimuth, and anti-skating. It also has a bubble level in the top of the bearing housing and a very easy to read micrometer to assist with setting VTA. Those aren’t the only changes, though. With the 12J2, the horizontal bearing used an axle of hardened tool steel configured as a needle on one end and as a roller bearing on the other end. The Turbo has a larger horizontal axle featuring dual micro-ball bearing assemblies. According to AMG, these changes yield enhanced stability and reduced friction, and my listening bears this out. The vertical bearing uses AMG’s patented bearing that is similar to that used in the rotor heads of helicopters. It uses two “spring steel wires” (the Turbo uses a newer wire) that allow fine tuning of azimuth while also eliminating any play in the bearing. The Turbo’s tonearm wand is made of an aircraft quality, anodized aluminum tube for resonance control and has an effective mass of 13.9 grams, slightly higher than the 12J2. The counterweight is a two-piece design with a Teflon decoupled sleeve with a thumbscrew to tighten it. The 12J2 is wired with three strands of 50 micron high-quality copper per leg whereas the Turbo uses multiple gauges of high-quality copper. Anti-skating is of the magnetic design with a decoupled ring magnet and two bar magnets. Like the 12J2, the new 12JT is designed to work with a wide range of phono cartridges.. There is a not lot to say about setting up the AMG Turbo tonearm; it is simply the easiest tonearm I have ever set up. In that respect, AMG certainly met one of their main design goals for the Turbo. If you have an AMG turntable, the 12JT Turbo simply drops into the same mount that the 12J2 uses. Anyway, after you have the mounting hole in the right place, you simply connect a tonearm cable of your choice (requires a straight DIN connector). The cartridge mounting system is ingenious and makes setting up the geometry a less than five-minute job if you use the jig that comes with the arm. I used the supplied jig and then went and got my arc protractor, which I had made for the 12J2, and double checked my results; I was surprised that it was absolutely correct all the way across the arc. The complete setup can be done without any tools. What could be simpler? One word of advice, though: while the large thumb screw for locking the base rendered the locking nut not needed after you get VTA set, I found it sound even better if you tightened them both; I confess I was not the first to notice this. 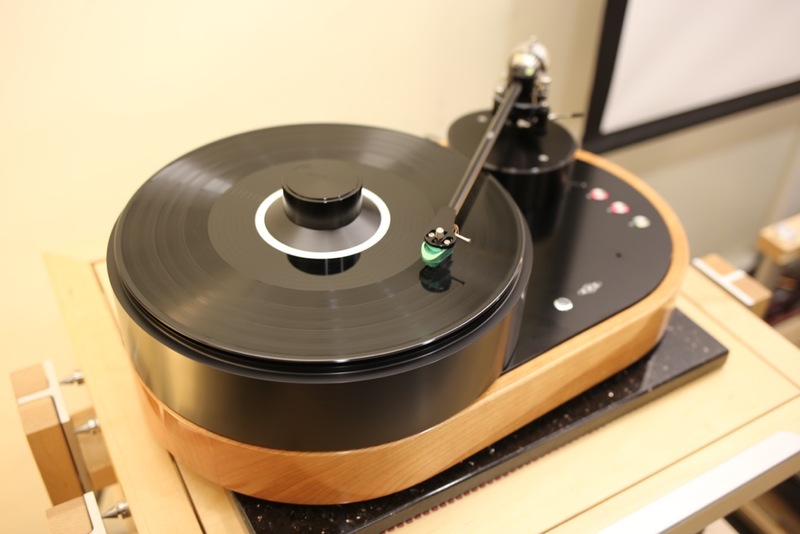 I have reviewed or personally used some pretty impressive tonearms, including the Clearaudio Universal Radial Tonearm, DaVinciAudio Grand Reference Grandezza, Graham Phantom, Ikeda Sound Labs IT-407CR12, RS Labs RS-A1, Thales Easy, TriangleArt Oris, Tri-Planar, and the VPI JMW 12.7 Tapered Twelve-Inch Tonearm. All of these are wonderful arms. 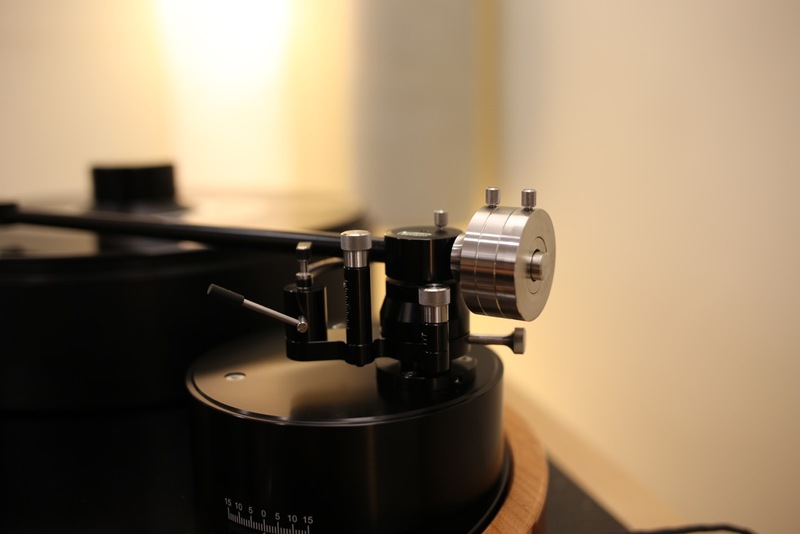 But for me, the best tonearm I have used in my system up to now was the AMG 12J2. So, what I was expecting from the Turbo was a more impressive looking and easier to set up tonearm with sound that would match my 12J2. For example, when Rickie Lee Jones sings “New Mother Earth,” the bass has all its bloom, but it drives the rhythm better, which results in a much more musical and emotional experience. On that same cut, the guitar has realistic attack and has enough solidity to sound like a real instrument, not just music floating in space. Another great example is Cassandra Wilson’s LP Blue Light ’til Dawn. This album is full of power and emotion. Cassandra Wilson is one of those singers who can make the smallest vocal phrases resonate with meaning, emotion, and power. The only time I have heard this conveyed better than my system played it with the 12JT was when I have heard her live. This album also has beautiful, full-sounding bass instruments. Like her voice, these instruments just sounded better with the Turbo than I had ever heard in my system. This album also has an impressive soundstage. Soundstaging isn’t the DSW1’s most impressive quality, though it’s more than adequate in this area. But when mounted in the 12JT, it produced as good a soundstage as I have heard from my system. That, combined with the air within and around those bass instruments, completely drew me into the performances. I thought the AMG Teatro, which I reviewed in August 2016, would be the perfect moving coil cartridge to use to compare the two AMG tonearms. I asked Garth Leerer at Musical Surroundings if I could borrow a Teatro and he graciously agreed. I wasn’t surprised that the difference between the two arms was even greater with a moving coil than it was with the DS optical cartridge. I suspect this is because of the 12JT’s ability to control the vibrations of the coils and magnets in the cartridge. With the Teatro mounted in the 12JT my system had beautiful, rich tonal colors. The leading edges of instruments were more precise and more musical sounding. The decay and space around and within instruments was simply “right,” which made for a wonderful and emotional listening experience. I think one of the reasons why it sounds so good is that with the 12JT, the Teatro is able to do an even better job at getting out of its own way, an area where it already excelled. 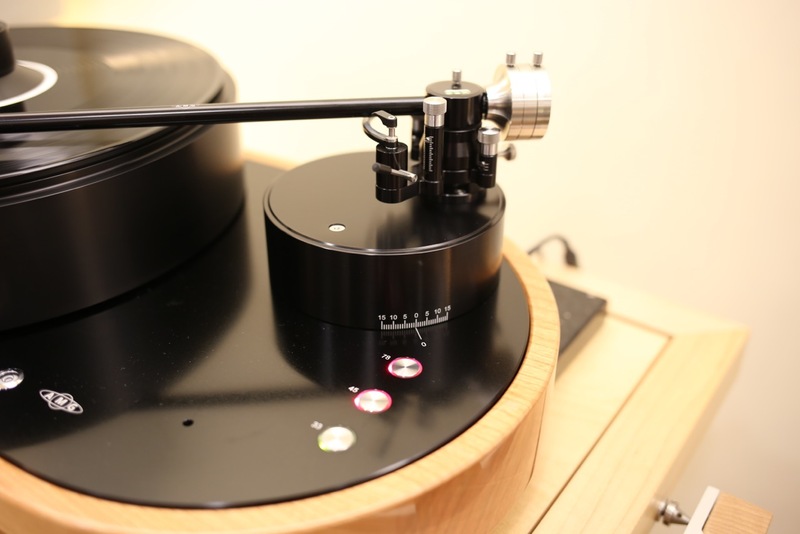 This tonearm allows the Teatro to almost rival the Soundsmith Strain Gauge or the new Optical DS cartridge. It doesn’t quite match them in this area of getting out of the way, but I feel you are getting everything you can get from this cartridge when used with the 12JT tonearm. The Allnic is a low compliance cartridge that usually needs a high mass arm to sound its best. One of the things that surprised me about the original AMG 12J2 tonearm was how well it worked with different cartridges, so I was interested in howthe 12JT would be with low compliance cartridges. The 12JT didn’t let me down with the Verito Z. It was the best I had ever heard this cartridge sound. I don’t know what it is about the design of the AMG tonearms that gets them towork almost equally well with high and low compliance cartridges. I would guess it has something to do with the ingenious bearing design, but all I know for sure is that it is a real blessing. I have been dying to hear the new DS Audio Master One cartridge in my system. I now wonder if it will make as big a difference as the AMG 12JT Turbo tonearm has. In many ways this tonearm does for my cartridges what the Pass Labs XA30.8 amp did for my speakers. It controls the cartridge in a way that makes a recording sound more focused, more powerful and more beautifully detailed than I had heard from my system before. It does this while making the system sound even more alive. By the way, the longer I listen to my system with this arm the more I love it. I’ll conclude by saying that the two twelve-inch arms from AMG are the two best tonearms I have ever used, but if you can afford the difference get the Turbo. Bearing: Vertical bearing design based on helicopter rotor bearings for precise alignment with the arm-wand. Uses two 0.5 mm thick spring steel wires, allowing fine azimuth adjustment and eliminating bearing play. Horizontal axle made from hardened tool steel and uses dual micro-ball bearing assemblies for enhanced stability and reduced friction. Extremely precise, maintenance-free, and never requires adjustment. Armwand: Constructed of top quality aircraft Aluminum, Anodized finish for resonance control.